Helen Smith, a Model United Nations icon in the Pace Upper School, convinced some of her top students, along with eager political buffs, to travel with her to Tufts University in Boston April 5-8. These willing students attended the Institute for Global Leadership’s policy simulation. The topic of this year’s Inquiry was nuclear non-proliferation. Although Ms. Smith is the most vocal about her love for these policy simulations, she was not alone when it came to organizing the Pace trip. Pace faculty members Don DuPree and Kaylan Haizlip helped with reading students’ policy papers and the trip logistics. Jason Smith, Lee Wilson, Melody Walter and her husband Steven Walter all chaperoned one of the largest attended policy simulation trips with 27 delegates from Pace. The 16 freshmen represented Israel and Pakistan while the 11 sophomores and juniors represented Russia and China at the event. 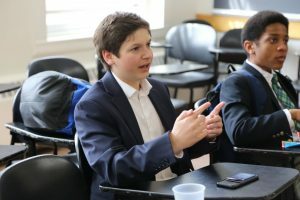 On Thursday, April 5, all delegates attended an hour-long seminar where Georgetown University professor Anthony Clark Arend posed a controversial solution to the countries’ disagreements regarding nuclear non-proliferation. “From the speaker’s references to the 1648 Peace of Westphalia to the deep concern about U.S. action needed before May 12 to reaffirm the Iran nuclear agreement (JCPOA) and closer security ties between Pakistan and Russia, we confronted issues that shape our world now and in the future,” said Ms. Smith. After the speech, students from different schools were separated into groups to discuss their opinions about the speaker’s ideas. The next day was the beginning of the actual simulation. The day included opening ceremonies, speakers, committee sessions and dinner. The committee sessions were meetings between delegates from every country. Each committee session focused on a different issue. For example, some of the committee sessions hosted delegates concerned with economy, terrorism or disaster preparedness. “The committee sessions were definitely my favorite part of the trip,” said freshman Casey Shoulberg. “The debates were super intense and I learned so much about current politics around the world.” The main goal of the debate was to create a new Non-Proliferation Treaty (NPT) that all delegates could agreed to, a seemingly impossible task. The next two days consisted of many hours of deliberation. At one point the students were presented with a crisis that happened in the world, usually a nuclear bombing of one country by another. The crisis was intended to intensify the debates and change the thinking for each country. By the end of the simulation each committee had created their ideas for the new NPT. Those ideas were later presented by a committee member and a new NPT was created. Although the weekend was filled with tedious work and fiery discussion between delegations, the Pace students got to enjoy their time in Boston. They explored the Isabella Stewart Gardner Museum, Massachusetts Institute of Technology, the Museum of Fine Arts and many dining spots. On top of the sight seeing, everyone got to walk through Boston neighborhoods with beautiful views, enjoy the snowfall and experience the subway.